DETAILS: Personalized Wood Carved Beer Tasting Set with Mini-Pilsners. This unique beer tasting set was created and stained by hand by a local wood-worker. 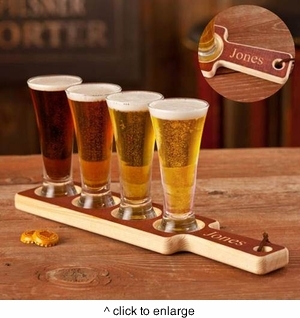 Each tasting paddle is adorned with a leather hanging strap and arrives with 4 mini-pilsner glasses.